Doug Paisley’s previous long player, 2010’s Constant Companion, became just that – a record that did not leave my side for months upon first entering its orbit. Following 2012’s Golden Embers ep, Paisley returns this month with his third album, Strong Feelings, once again via the always steady No Quarter Records. And like its predecessors, the record is imbued with a strong sense of haunting nostalgia. 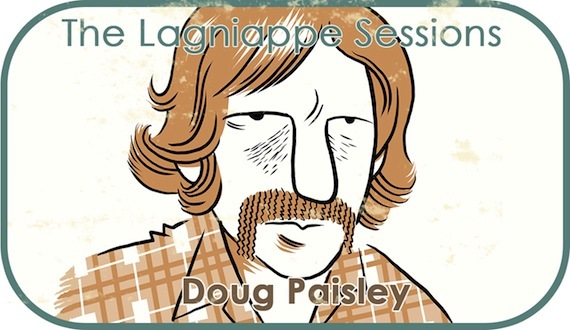 For this installment of the Lagniappe Sessions, Paisley takes on two tracks made popular six decades ago by a pair of American iconoclasts – Elvis Presley and George Jones. I’ve had a couple of opportunities to stay in Kingston, Jamaica with reggae musician Earl ‘Chinna’ Smith. Chinna’s house is ensconced in a tiny jungle steps from the insanity of the city. This video is an accurate representation of the scene there. Chinna wanted me to record ‘Love Me Tender’ because he thought I sang a little like Elvis. I recorded it in the garden with the wind chimes and lizards sunning themselves and Chinna arranged the vocal harmony parts. I had to fight to keep the harmonica part in. Every Jamaican of a certain age who stopped by while we recorded it remembered seeing the film Love Me Tender at the cinema in the 50s and that when the song came on it made everyone cry. I got into George Jones’ version of this song. Its songwriter, Autry Inman, was also a prospector who discovered uranium on his property and developed a mine. I’ve always thought songwriters and prospectors have something in common. As a kid I was known as a sore loser because I hated to lose at boardgames. Because he can’t let go: “I’ll hold on as long as I can because I’m the world’s worst loser when I’m losing you” the singer is a bad loser as opposed to a good one. We’ve all got to lose sometimes but it’s not something anyone really wants to get good at. Lagniappe Sessions Archives / original illustration for aquarium drunkard by Ben Towle. I hadn’t heard Mr. Paisley before. Now I’ll be buying his records. That’s how this is supposed to work, right? actually first heard Paisley through AD a couple years back. all over this new record. Beautiful stuff. I’ve been a big Paisley fan for a while now. Pure quality. Very nice to have these bonus tracks. Thanks for these beautiful covers. His version of “World’s Worst Loser” is the best song I’ve heard in a while.